Princess Mabel was invited by Queen Elizabeth for the state banquet of tomorrow. It was announced today that Prince William and Duchess Catherine are also attending. Was wondering if we'd see the Duke and Duchess of Cambridge at the State Banquet! Agreed. But then, 99% of the British people wouldn't know the Dutch king and queen if they passed them in the street so there's been limited press coverage of the offensive comments. Even fewer would know the Dutch PM. This much reduced visit has the feeling of an afterthought with very limited press coverage apart from the Mail online who'll cover just about anything. The meeting of two completely powerless heads of state means nothing for the people of either country and is a complete waste of time, money and effort. I'd far rather my taxes were used for something that would make a real difference. Haven´t you voiced this opinion enough over and over again since this state visit was announced...?! Well, the dutch King doesn´t seem to be that powerless as Duc pointed out, WA being part of the dutch government, other than the other european monarchs... The King will at least meet both your PM as well as the leader of the opposition which I find quite striking! I think it is quite a weird view to claim "only heads of state with power can do state visits". As a result of that Britain could never exchange state visits with countries like Denmark, Sweden Germany, Italy, Japan etc. as all of these countries have, royal or presidential, representative heads of state beyond politics! State visits do exist for several reasons, which I do not want to repeat again like you obviously like to do....! The King of the Netherlands is not that "powerless". Only two weeks ago constitutional specialists urged the Cabinet to appoint a "designated survivor" in case the King and Queen as well his brother Prince Constantijn would be hit in an attack, together with the members of the Council of State (for an example, all assembled in the Hall of Knights for Prinsjesdag). Argument of Prof. Dr. Paul Bovend'Eert (Constitutional Law, Nijmegen University): "It is more important that there is such a replacement for the King (in case of Amalia's minority) than that members of the Cabinet or the Parliament survive the attack ( ) because the royal authority is necessary, after such a catastrophic attack, to keep the machinery of state running, as every Act, every Royal Decree, every appointment of High Colleges, Governors, Lords Justices, etc. needs the royal assent, which is the legitimation of the authority of the State"
Would that replacement have to be royal (although there is no other royal at the moment) or could it be an appointed regent? 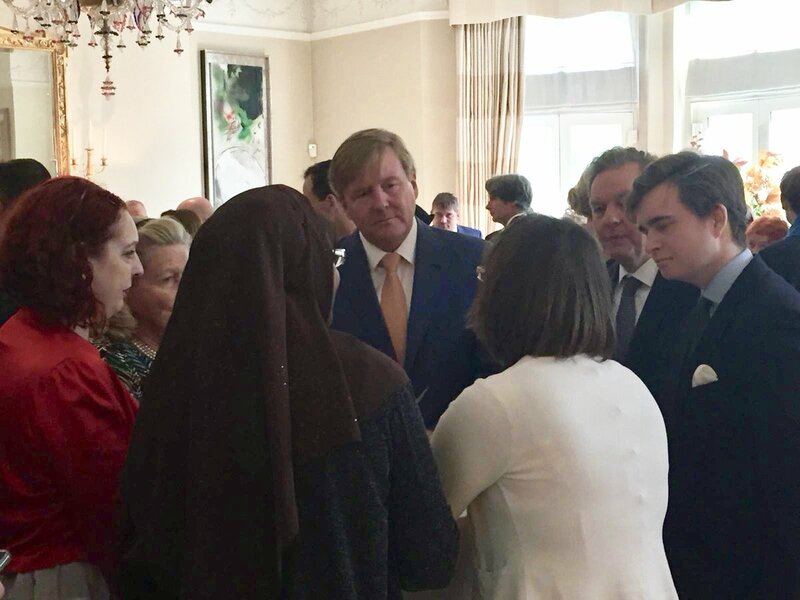 From what I understood if the King, Queen and Prince Constantijn are unable to do so, the royal power will be transferred to the Counsil of State until the majority of the Princess of Orange. So the idea was to have the Counsil of State appoint a designated survivor who stays behind in a secure location during Prinsjesdag, which is the only time that the entire government, Royal House, parliament and Counsil of State are together on one location. Focus on Dutch citizens in the UK that want to tell the king about their Brexit-problems. 'Finally' the headline says. They mention that it is exceptional for the king to work during the autumn holidays of his daughters but that he made an exception for this state visit. Much of the article focusses on insecurities of businesses and citizens due to Brexit. Headline mentions 'exciting (Brexit)-times'. Apart from attention to Brexit and previous visits they mention that it will be the 112th incoming state visit for Queen Elizabeth II. Talking about the 'shadow of Brexit' over the visit and claims that the two royal families serve as a mirror of their countries. They mention that the visit was in the works for years. They say that for the Dutch king a state visit to the UK can be regarded as the 'champions league of state visits'. They also mention the Zr. Ms. Zeeland passed the Tower Bridge yesterday and is docked in London. Also mentions 'the shadow of Brexit' in the headline. 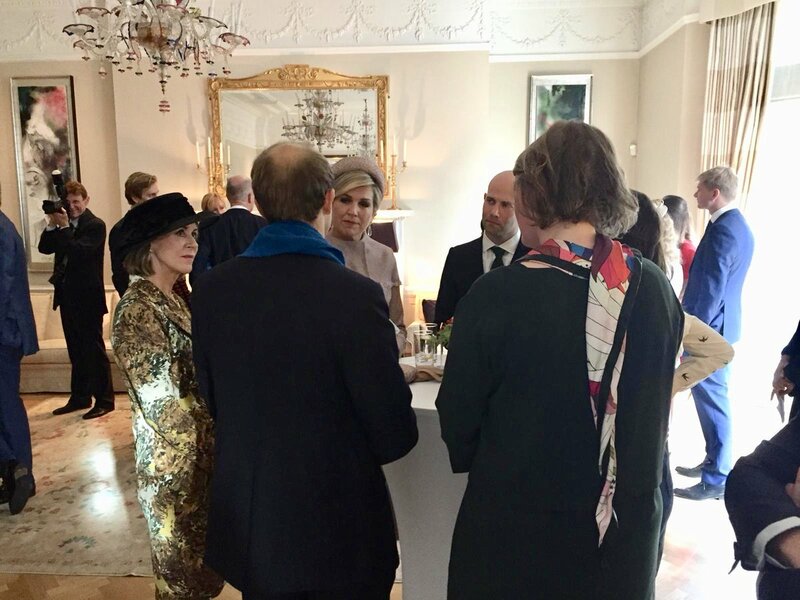 The newspaper claims that now regular meetings in Brussels will be a thing of the past, the bilateral meetings will become more important, such as these kind of royal visits. They also claim that Queen Juliana broke three protocol rules within the first five minutes during her 1972 state visit: talking for too long, walking next to the red carpet and kissing the wrong way. The rest of the article focusses on Brexit. Focusses that Princess Mabel has been invited to attent the banquet. 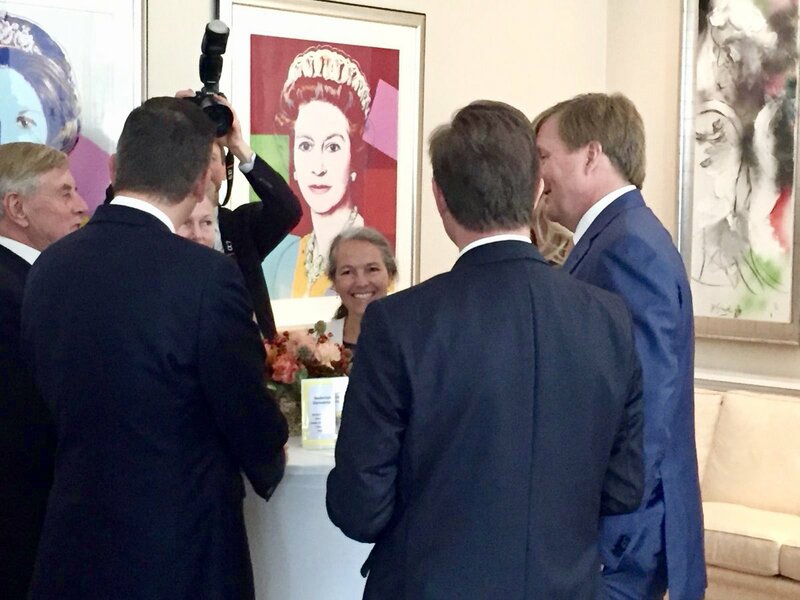 Tonight on NPO2 / MAX (a tv station focused on the elderly) they broadcasted 'Door andere ogen' (through another set of eyes), a program comparing the Orange-Nassau's to the Windsors. The tone seems to be: the cold, stiff & glamorous British Windsors vs. the down-to-earth & human Dutch O-N's. This is the usual angle when comparing the Dutch RF with the British one. IMHO it says more about how we want to see ourselves than about reality. Lia van Bekhoven (correspondent for the NOS in London): "The British only know that she does her duty, other than that people don't know anything about her and she does not seem to do her work with a lot of pleasure. She killed her first deer during her teenage years and broke the neck of a pheasant a few years ago". They conveniently forgot to mention that the king also hunts animals. Several comments about the uneasy looks of members of the RF during the wedding ceremony of prince Harry and Meghan Markle. Remarks about the British class society: we are co-citizens, they are subjects. The queen -almost in a medieval fashion- moves from palace to palace depending on the season. We are a country of vicars, showing of your wealth like in those enormous palaces in the UK would be impossible here. When the queen shows her magnificent Goya's, Gainsborough's etc. she usually comments about the painting that it must be 'some Dutch master'. The program compares Queen Maxima and her work to the British. They showed clips of her talking in an animated way to other people 'like equals' and compare it to 'the semi-sacred way" the British RF is treated. Lia van Bekhoven claims that Theresa May issued the invitation to show that they still want to be friends with Europe. The program ends with some attention to the Stuart diamond and with the hope that the queen will wear it this time. "I can not think of a better occasion to wear it' says Marc van der Linden. Quite exceptional to see that on prime time on the second channel. In short: not a great program, making a caricature of both the Dutch as the British RF's to suit a narrative that would please the viewers. Well, who heck does that Bekhoven woman think she is - and whom is she talking about? Is she talking about the lady who was described by commentators (during The 80th Birthday Celebrations in 2006, The Diamond Jubilee in 2012, The Longest Reigning Monarch milestone in 2015, The 90th Birthday Celebrations in 2016 and to this day) as ''The Queen of People's hearts, The People's Queen, Elizabeth the Great, The Queen of the World and the worlds most popular/famous/iconic person''? Or did she talk about the lady who went on walkabouts (with her smiley face) from 1970 to 2013, or the lady who was driven in the ''Queenmobile'' (open-top car) from 1952 to 2013? Or did she talk about the lady who has modernized the monarchy with allowing film-teams to follow her for BBC/ITV documentaries in 1969, 1992, 2006, 2007, 2012, 2013 and 2016? - Or when she marked her two last Jubilees with pop/rock-concerts in 2002 & 2012, or when she ''jumped'' with James Bond during the Olympic? Or did she talk about the lady who is known for her kind, warm, caring, calm and down-to-earth personality who always shows up with a smile on her face? On today's world stage, one leader stands apart. Queen Elizabeth II has seen more of the planet and its people than any other head of state, and has engaged with them like no other monarch in British history. Since her coronation, she has visited over 130 countries across the ever-changing globe, acting as diplomat, stateswoman, pioneer and peace-broker. She has transformed her father’s old empire into the Commonwealth, her ‘family of nations’, and has come to know its leaders better than anyone. In 2018, they would gather in her own home to endorse her eldest son, the Prince of Wales, as her successor. With extensive access to the Queen’s family and staff, Hardman tells a true story full of drama, intrigue, exotic and even dangerous situations, heroes, rogues, pomp and glamour – and, at the centre of it all, the woman who has genuinely won the hearts of the world. Hmm, was there anything more to say? Well, two more things: According to several friends of HM (including Anne, Lady Glenconner), she actually enjoys being monarch (not that difficult to see either BTW). And we actually know much more about the Queen (due to all the documentaries/books) than we does about any other head of state in the world today. But Bekhoven probably got her information from a Dutch expert, who apparently don't know what he/she is talking about. And if we take other members of the BRF: Well, both Charles, Camilla, the Cambridges, Sussexes & Sophie is (like the Queen) as down-to-earth as the DRF (if not even more). Nice that Princess Mabel is invited for the State Banquet. I think she will not wear an Order, as even at the Investiture of her brother-in-law she was not seen with any Order at all. Lia Bekhoven lives and has lived as a correspondent in the UK for decades. But the RF obviously is not her forte. Most things she is telling seem to be from the British tabloids themselves. There will be very few Dutch experts on the British queen and the articles we do get here are often quick translations of articles in the Daily Mail and such. I doubt the vast majority of people here will know much more than the period of Diana's funeral and the fact that she will never abdicate. If Beatrix would still be reigning the angle of the down-to-earth Dutch RF would not have been possible either because Queen Beatrix was a lot of things but not very down-to-earth. Comparing a 50 y/o man with a 92 y/o woman obviously will find differences in style. What time is the welcome ceremony ? Should be at 11.45 GMT at Horse Guards. Isn’t the limited press coverage a result of most or all the Royal reporters being on the other side of the globe? I’m sorry but it really doesn’t sound like W-A said anything that dissed Britain or the people of Britain. He expressed some concerns for how Brexit would play out-he is entitled to be looking out for his country. It seemed fairly diplomatic. Looking forward to the State Dinner, I hope we get some decent photos. And it is significant that Philip deems this visit worthy of participating at all. Lovely to see The King and the other gentlemen in jacquet for the Welcome Ceremony. That is already better than Don Felipe in just business suit. No Duke of Edinburgh, unfortunately. And no Duke and Duchess of Cambridge for the welcome. Perhaps they will be at the lunch at BP. HM voiced the opinion of the Dutch government only,as he is entitled to. Lack of british press?Rags you mean?Oh well,TM will surely survive their absence. Always interesting to see how the protocol is evolving due to the DOE's retirement. So who's going to be riding in all those state/semi-state carriages they are getting ready? The British queen is very fit for her age, climbing that small wobbly stairs of the carriage! Queen Beatrix had special stairs made for the golden carriage so she would not have to use a simular one - and she is 12 years younger! 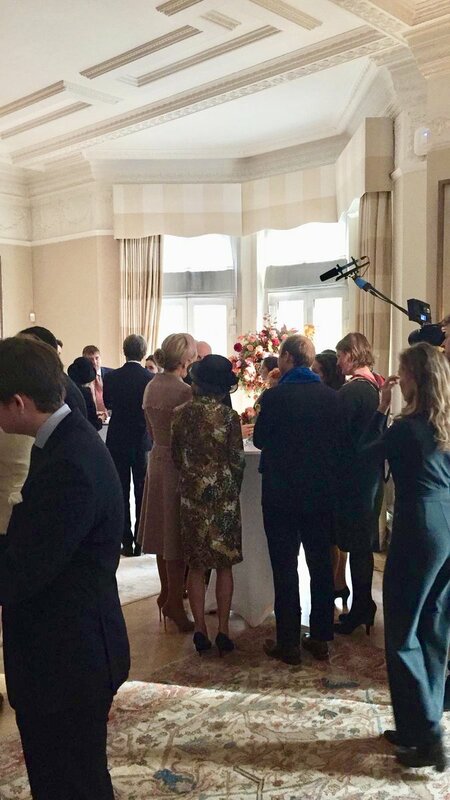 It seems that the lady-in-waiting who is accompanying HM is Anna Magdalena (Annemijn) Crince le Roy-van Munster van Heuven. I also noticed the Grand Master of the court, Jan Versteeg, who was seated in the same carriage as our minister of Foreign Affairs. Nice portraits of William & mary in the ambassadors residence, and a curtsy from the Duchess of Cornwall.